There’s nothing like a bowl of piping hot soup to warm you up on a cold day. It’s also the perfect meal to have if you are trying to eat right (and who isn’t especially this time of the year), and watch your weight. The other day, I made a hearty potato and leek soup- the perfect antidote to the cold weather we have been having lately. Melt the butter in a large pot; add leeks and garlic, season with salt and pepper. Cook till leeks soften. Add the cubed potatoes along with a cup of water. Cover and cook till the potatoes are tender and start to crumble. Add the milk and continue to cook till it becomes thick and creamy. This is one simple and delicious soup I will be making often. Lisa @ Lisa’s kitchen for kicking off the event- No Croutons Required. Sia @ Monsoon Spice for the one-off Ode to Potato event. DK @ DK’s Culinary Bazaar to celebrate The Potato Fe(a)st.
That looks so thick, creamy and comforting :) I've been hearing only good things about adding leeks to soup.. must try it. Nice picture (as usual...). Have a great weeek ahead. mmm..looks soo creamy and i like the way you have swirled the soup..looks stylish! I love anything potato and this one too though I am not a soup lover. Creamy and a very comforting one at that! Great prsentation. Looks delicious and soup is a God-send for this cold winter. Makes you feel good from head to toe. 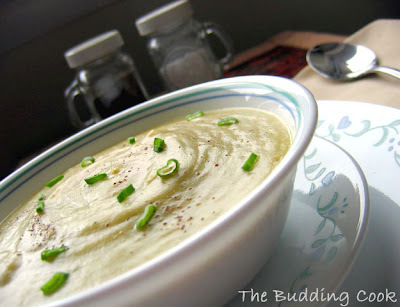 I need to try this potato-leek soup, it looks great! I have always had this in restaurants. Never attempted to try this one. Sounds simple, and will surely give it a shot. It's so creamy and wonderful. Proceed to take pictures - LOL! I like the way the picture has a sense of motion in the swirl of soup at the top! Love the soup TBC. Potatoes n soup - comfort of the highest levels... will try this out. creamy, and delicious! Lovely picture with that cool swirl. One of my French friend, had made a soup with just leeks, with n0 potatoes, they were absolutely yummy. It looks so creamy!! YUM! Great soup and beautiful photo. Thanks! this is called soul food, nice pic. I love leek and potato combo. hi!! browsed thru your blog and enjoyed it....you have an amazing blog .are you an expert in soups...i am going to try all of them. RC- thanks. :-) It was just perfect for the bone-chilling weather we have been having lately. Archana- I should try using only leeks the next time. Will taste more or less like an onion soup, won't it? Richa- yeah, we've been having that kind of weather too.But I'm not complaining. I just wish we could get a little snow as well! Uma- welcome to my blog. :-)Thanks for the compliment. That is such a lovely soup tbc. I never made any soups at home, as I only like tomato soup and love to have it when I go to restaurants. But your list of soups are tempting me to try one at home. Mallika- are u back? how was the trip? Cauliflower soup sounds good too. I've got one somewhere around here. I cannot say that I'm familiar with harissa, though I do remember reading 'bout it on one of the other blogs. I'll wait for your soup spiced up with harissa. I love my immersion blender too. Sometimes, I make soups just so that I can use it! ;-). Isn't it such a timesaver! EMWK- thanks:-) Hope u had a good one! Sukanya- thank you:-) It is nice to see u here after a long time. How was your trip? Nice to see u.:)How are you doing now? Visit only when u can...no pressure. BTW, is your blog not on Taste of Inida? Ooooh, your soup is so beautifully creamy - the perfect proof that creamy soups can be light and healthful and delicious, too!